TOKYO (Reuters) - Japan will try to avert steep tariffs on its car exports and fend off U.S. demands for a bilateral free trade agreement at talks on Thursday in Washington, but a quick fix for the trade imbalance between the two countries appears elusive. 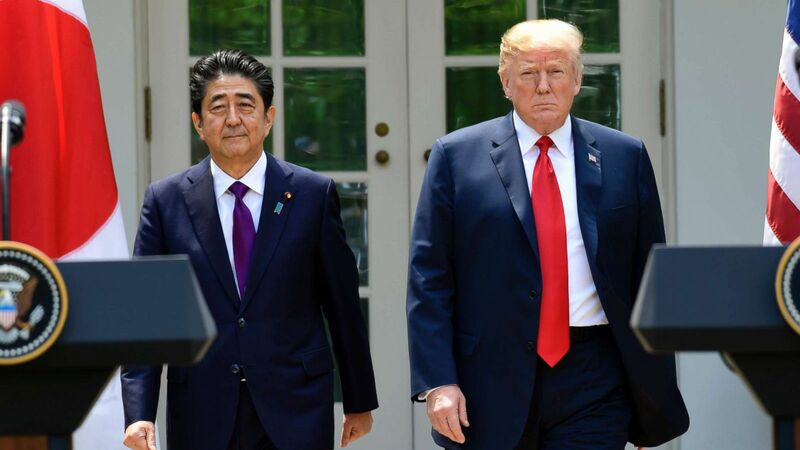 Interviews with Japanese trade officials and politicians suggest Tokyo is struggling with a strategy to persuade U.S. President Donald Trump to abandon his aggressive push to reduce the $69 billion (£53.5 billion) trade deficit with its security ally. Japanese Economy Minister Toshimitsu Motegi will discuss the issue with U.S. Trade Representative Robert Lighthizer as part of talks on “free, fair and reciprocal” trade, the framework to which Trump and Prime Minister Shinzō Abe agreed in April. But an actual deal - if any - looks more likely to emerge when Abe next meets Trump, possibly in September on the sidelines of a U.N. General Assembly meeting, officials said. “The Lighthizer-Motegi talks will be to check out the situation on both sides. They will not lead to a quick resolution,” said Akira Amari, a former economy minister. “Ultimately, any resolution will be between President Trump and Prime Minister Abe,” he told Reuters. Trump wants a two-way free-trade pact, but Tokyo is wary because such an agreement would boost pressure to open sensitive markets such as agriculture. Nor is there any guarantee that a free-trade agreement (FTA) would change the balance of trade, Japanese officials said. “Japan does not desire an FTA and these talks are not at all preliminary discussions on an FTA,” Japanese Deputy Chief Cabinet secretary Yasutoshi Nishimura told Reuters this month. The Trump administration is also exploring raising tariffs on foreign auto imports, including those from Japan. Officials say such a step would do serious damage to the two economies and to world trade. Japan wants Washington to return to the multilateral Trans-Pacific Partnership, which Trump abandoned after taking office last year. But officials acknowledged that may be unlikely. Business daily Nikkei said last week that Japan was considering creating a sovereign wealth fund to invest in U.S. infrastructure projects and U.S.-Japan joint projects in third countries, and would float the idea at the talks on Thursday. Japanese officials have said the government would encourage such investment. But Aso, who is also the finance minister, said that Japan had no specific plans for a sovereign wealth fund. Japan is also expected to increase imports of liquefied natural gas from America and buy U.S. military equipment as needed, officials said. Nishimura and others ruled out accepting limits on Japanese auto exports, a tactic deployed during trade disputes in the 1980s and early 1990s before the 1995 launch of the World Trade Organization, which generally bans such steps. “Numerical restraints on auto exports are impossible. We have had no such demand from the United States,” Amari said. Japanese officials have expressed frustration at being pushed towards a goal of slashing the bilateral imbalance, which they see as unrealistic given the dynamics of global trade and efforts made to date by Japanese firms to boost U.S. production. A source familiar with the Japanese government’s thinking said Japan should point out that, among other things, its companies have created nearly 30,000 new jobs in the United States since Trump took office. “If more is expected, you tell me how (to do it),” the source said. Japan’s Nikkei share average edged lower on Wednesday ahead of the talks as players braced for a tough U.S. stance on trade. A trade skirmish with the U.S. could cause the yen to rise against the dollar, hurting Japanese exporters. The Japanese currency has hovered around 111 yen to the dollar for the past couple of weeks.